The Bank of Thailand board yesterday approved the printing of new banknotes as the present currency notes - the "15th set"- had been in circulation for 12 years now. The 16th set banknotes - those worth ฿20, ฿50, ฿100, ฿500 and ฿1,000 - would include more anti-counterfeit features. The new set format was currently awaiting approval from the Royal Household Bureau. It was expected to be distributed for use after December 5. Assistant to the BOT Governor, Jittima Duriyaprapan, said the bank's fake banknote monitoring team had found a 39 per cent drop in the first half of this year, compared to last. About half the fake banknotes were found in Central Thailand - especially Pattaya, Ayutthaya, and Khamphaeng Phet- because the region had more cash flow than other regions, and the bank had worked with police to trace the sources of these counterfeit banknotes, she said. How does ฿20, ฿50, ฿100, ฿500 and ฿1,000 compare these days to USD or Pounds or Euros? Are there images of the new notes anywhere yet? I collect the commemoratives they come out with and some of the circulating notes. No, there are no any images out yet. We'll see when the design is approved. I went to 'Thai Bank note Expo' today and chatted with one of staffs. She said that the media got the wrong date. It's actually still in designing process. The release date is expected to be in December 2011, NOT this year. New 50 baht note just was noticed in gazette. Main color is still blue. It will be the same size. 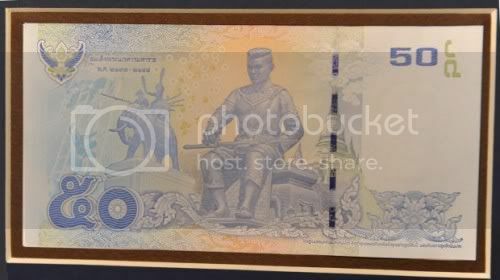 The reverse will be King Naresuan instead of King Mongkut in present note. There is no release date from Bank of Thailand yet. Do you think a new 50 baht note will pave the way for a 20 baht circulation coin? There is no quarantee for that. IMO Because all denominations already have new signature, Korn-Prasan, except 50 baht note. New gov. is forming meaning new Financial Minister. 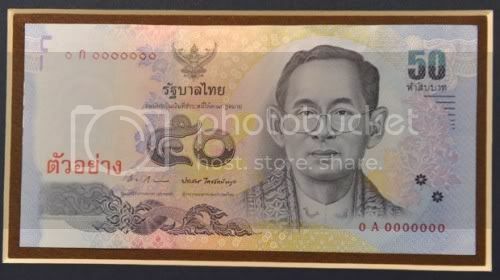 I guess that is the right decision to release new 50 baht note first, with new sig. Additionally, there is no any news from Treasury dept. about 20 baht circulation coin either. Mr. Prasarn Trairatvorakul, Governor of the Bank of Thailand, today announced the introduction of the new series of Thai banknotes (Series 16) into circulation. 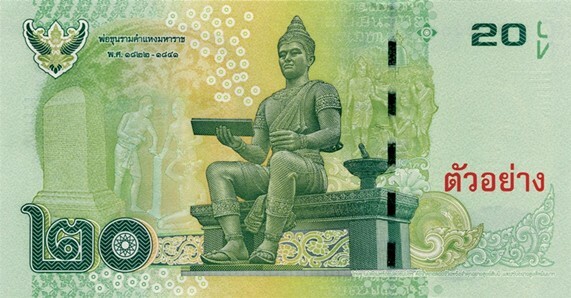 The Series 16 is designed to glorify Thai kings of different periods. A range of new advanced counterfeit deterrent features have also been incorporated into this design to facilitate authentication both by banknote sorting machines and by the general public, including visually impaired persons. 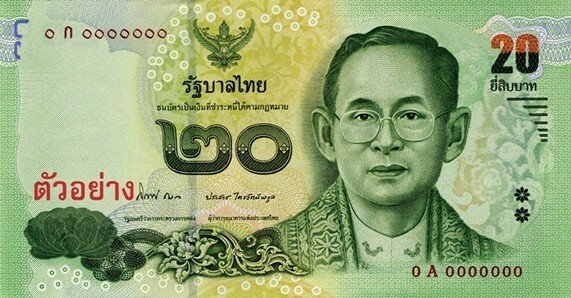 The denominational range of the new series, which retains the sizes and the colors of the current series (Series 15), consists of 20-Baht, 50-Baht, 100-Baht, 500-Baht, and 1000-Baht. Each denomination of the new banknotes will be issued separately, with intervals between releases, so it will take several years until all denominations are introduced. 1. The watermark depicting the portrait of the present King appears alongside the denominational electrotype reading “๕๐”, clearly visible when viewed against the light. 2. The windowed color-shift security thread located vertically like stitches on the back of the note changes its color from dark blue to red when viewed from different angles. 3. The irregular shapes of the see-through register printed on the front and the back are combined to form the denomination numeral “50” when the note is held up to the light. 4. Aside from the raised print of letters and denomination numerals, two tactile marks in the shape of flowers in dark blue, representing the Braille number 5, can be identified by touch. The existing as well as the previous series still remain legal tender. Last of new series, 1,000 baht banknote, is expected to release next year. Also new commemorative banknote 100 baht celebrating 5th cycle birthday of Princess Sirindhorn is cooming soon.